On April 3rd the High Commissioner for Human Rights, Michelle Bachelet, addressed the Security Council on the “Human Rights Situation in Haiti.” She marked the progress made so far on human rights, highlighted areas of persistent violations, and advised on how the Security Council can strengthen the rule of law, development, and peace during the proposed transition of UN operations in Haiti by promoting and protecting human rights. 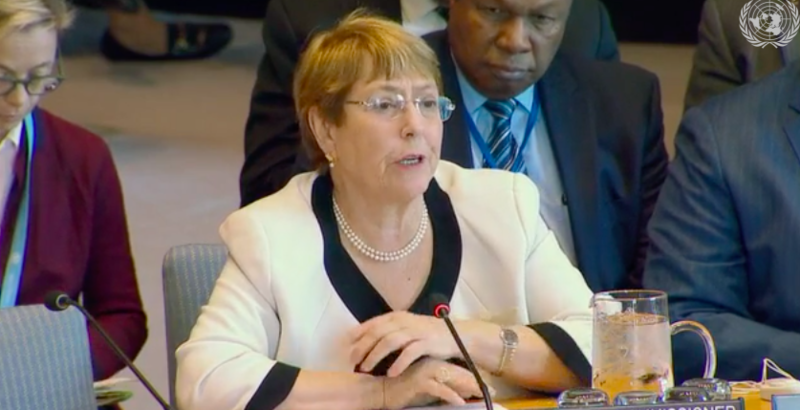 The High Commissioner gave her statement during the Security Council meeting regarding the planned closure of the United Nations Mission for Justice Support in Haiti (MINUJUSTH), and possible transition to a special political mission (SPM). Jean-Pierre Lacroix, Under-Secretary-General for Peace Operations, presented the Secretary General’s report on MINUJUSTH (S/2019/198), which contained recent developments, including violent demonstrations, and persistent humanitarian concerns. The report emphasized the need to strengthen national institutions, particularly the police force, given persistent reports of human rights violations by members of that body. The Secretary General’s report also recommended having a small advisory office in place. High Commissioner Bachelet noted that her office has supported authorities in targeting corruption and ensuring accountability while fostering dialogue between different stakeholders in Haitian society, and she also highlighted domestic Haitian human rights initiatives such as the appointment of the Minister Delegate for human rights and the fight against extreme poverty, the Inter-Ministerial Committee for Human Rights, and the Office of Ombudsman. She also noted the positive engagement of civil society, though she expressed concern that civil society has continued to face intimidation. She encouraged the Security Council to support Haiti to “promote and protect human rights as a foundation to stability and development,” adding that her office would pursue a possible follow-up and eventually a stand-alone presence in the country, working with the government and with support of the Security Council and Member States. Loune Viaud, Executive Director of NGO Zanmi Lasante, Partners in Health’s sister organization in Haiti, also briefed the Council, encouraging Member States to see the urgent need for access to women’s health as a critical component of “reinforcing the relationship between sustainable development and security,” while calling for greater protection for women and girls from gender-based violence. Many of the Member States present supported the idea of having a special political mission (SPM) for Haiti, with several remarking that it must include a human rights component. The United States recommended that the SPM include a human rights pillar, while Poland stressed that “it goes without saying that human rights and development are interconnected,” urging that the political mission to replace MINUJUTH should consistent of key components related to democracy, rule of law and human rights. The UK urged that “human rights need to come front and centre” if real progress is to be made, noting that the new SPM must give special attention to human rights and women’s rights. The representative added that States with human rights violations are less stable, less able to meet their people’s need and are more likely to pose a threat to international peace and security. Cote d’Ivoire remarked that they welcomed the authority’s efforts to promote human rights, as essential to achieving the SDGs. Peru noted that strengthening the rule of law, justice system reform and the protection and promotion of human rights are essential at this turning point for Haiti. South Africa emphasized that a State which takes steps towards reconciliation fosters an environment that conducive for the growth of effective institutions, while also recommending that the Council must closely follow the situation on the ground, particularly in light of the potentially contentious elections in the fall. The Dominican Republic, while supporting the Secretary General’s views, urged a slow transition taking into account all points of structural weakness and human rights challenges. The Haitian Minister of Foreign Affairs thanked the High Commissioner for her remarks on the promotion of human rights in Haiti, and for the Secretary General’s report which he noted paints an objective picture of the situation. He agreed with the recommendation for a SPM, and urged that the government of Haiti see UN support as essential and that promoting human rights, rule of law, and international institutions should go hand in hand with economic and sustainable development. This is the High Commissioner’s second address to the Security Council. Her first address took place on March 11th, at UN headquarters in New York City at an Arria-Formula meeting, on the topic of “human rights, accountability, and justice: contributions to international peace and security” (read about it here). It is very encouraging to see the High Commissioner be invited twice in two months to speak with members of the Security Council, and to be warmly received, as this level of engagement has not been guaranteed or consistent in the past. It is also positive to see several Member States recognize the importance of having a human rights component in the Special Political Mission as key to bolstering institutions and securing long term stability, as well as having no States overtly objecting to it. Connections were drawn between human rights and the SDGs, and instability and impunity. States remarked on the need for capacity building and monitoring to not only preserve gains but to progress further, as well as as to prevention further violations. Many States recognized Haiti’s domestic efforts, as well as the benefits of engagement with the UN system. During the conversation, Equatorial Guinea pointed out that the UN’s presence through special political missions, not peacekeeping operations, is what is essential for rebuilding Haiti’s institutions. The new reforms of the peace and security architecture of the UN are in part intended to tighten the three UN pillars (development, human rights and peace and security), all of which were discussed in this meeting. Furthermore, given the new “whole of pillar” approach with which the new peace and security offices have been designed (namely, the newly created the Department of Political and Peacebuilding Affairs (DPPA) and the Department of Peacekeeping Operations (DPO)), many believe this will have a positive impact on transitions from peacekeeping operations to, among other manifestations, special political missions.